Part of Sandgate Road was closed while emergency services worked to extract the man who fell about 20 feet. Supermarket destroyed by fire to be replaced with a permanent store next year. The group, believed to have crossed the Channel, called police to say they were in trouble on Sunday morning. A man from Folkestone who filmed secret videos of school children has been jailed for more than four years. A pioneering experimental play and drama scheme in Folkestone, is helping those children who have autism. A recreation of a space pod, with puppets, light and sound, encourages the youngsters to communicate. Kevin Harrison's report includes interviews with Rolan Rouse who has been using the space pod, Dr Melissa Trimingham from the University of Kent, and the Assistant Headteacher of the Beacon School where the project is based, Lynda Evans. A 61 year old man sadly died from his injures after coming off his bike. 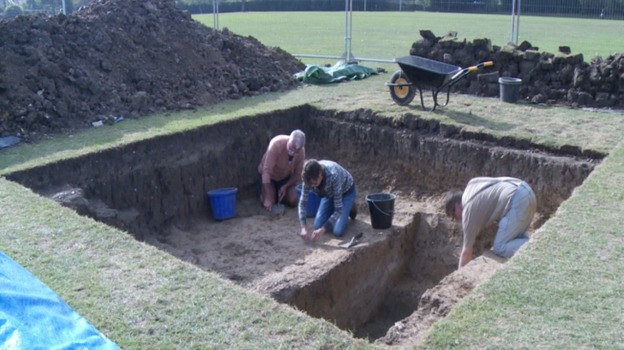 Archaeologists and volunteers in Folkestone have unearthed an ancient watercourse, said in legend to have have been created by an Anglo-Saxon Princess. The engineering was so complex people believed the 7th century Princess had performed a miracle because the water appeared to flow uphill. The water travelled for two miles towards St Eanswythe's convent in the heart of the town. The water-course provided Folkestone with water for centuries and is believed to be one of the reasons the town was situated there. The nature of its injuries have led police to link it to the killer who is thought to be responsible for the deaths of hundreds of cats.